a prototype android smartphone in development by japanese mobile phone operator NTT docomo and fujitsu technology, features a transparent display, with touchscreens on both the front and the back of the device. 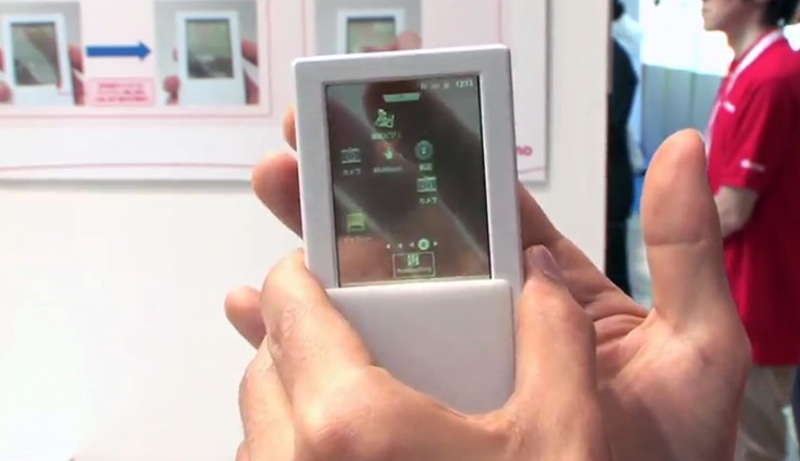 the unit could offer increased flexibility of touch-based interaction. in the demo video, researchers offer the example of a rubik cube game: holding a finger still on the back of the screen indicates that the cube should remain stationery while users rotate individual rows, while keeping the screen back free lets users rotate the entire object itself in virtual 3D space. alternatively, scrolling via the back of the screen keeps content visible when reading or web browsing. the panel of the screen measures 2.4-inches, which the developers hope to increase should they design a production model. other plans include the improvement of the screen brightness to be more visible in high light levels. I agree in principle! Product innovation should focus on real benefits for the mankind. Nevertheless, a transparent multimedia screen could have other interesting applications like enhancing machine operation interface integration with the real environment when this is crucial for safety reasons.